These unpunched 14mil 8.5" x 11" frost poly covers from GBC are durable, spill-proof, and tear-proof. Additionally, these letter size translucent frost covers will show off your title pages and provide a premium look to your reports and presentations. GBC's letter size frost covers are perfect for use with any binding style (see list below). With more than 200 other frost covers to choose from, you're sure to find the exact cover for your needs. This unpunched 14mil 8.5" x 11" cover's product number is 2000919G and comes in packs of 100. We use this all the time and have used this for several years. We used to order from another vendor and found that MyBinding.com is much cheaper for the exact product. Poly covers frosted Review by Kelsey S.
Love them! Order customized to cut and round edges. Customer service was great and super helpful. So glad I found my binding! Office Manager Review by James R.
I purchased both the un-punched and punched options. After using I find the un-punched to be easier to line up perfectly and use. The coloring wasn't bad as another review noted. They have a foggy tint though, not crystal clear. Overall for our needs they are satisfactory and seem to get the job done. I would recommend this product for anyone looking to purchase a heavy duty cover. Bad coloring Review by Henry W.
We've previously ordered these frost clearview poly covers and they were clear and worked great. This order, they had a yellow hint to them and do not look nearly as good. I hope this was just a one-time occurrence and the next order we get will be better, otherwise we'll have to find another company to order from. Transcript: Welcome to MyBinding.com. These are the GBC 14mil Frost ClearView Poly Covers with Square Corners. These poly covers are extremely durable, being spill proof and tear proof, they’re guaranteed to protect all of your pages. The opaque view and soft texture gently blur your cover page, while still being able to read the contents. They come unpunched, or pre-punched to whatever binding size you need. You can even add business card slits. Welcome to MyBinding.com. These are the GBC 14mil Frost ClearView Poly Covers with Square Corners. 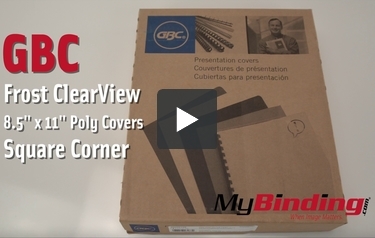 Do you customize the ClearView Poly Covers? I'm looking for 11.5x11 size or close to. Please let me know. Thank you.